Welcome Company | Sharing the joy of creating and keeping good company. You may have gathered that life has been a bit hectic around the Hacienda lately. I am guessing that is really not surprising as life these days is hectic for most of us. We understand over-committed, over-taxed, way too busy, spread too thin, wearing way too many hats, just hangin’ on. And somehow, we just keep piling it on. Doing, doing, doing, to the point of exhaustion. Going, going, going to the point of gone. The craziest part is, we do it to ourselves. Yes, I can do that. Yes, I’d love to help. Yes, I can write that, make that, bake that, decorate that, plant that, plan that, chair that. Give it to me, I’ll do it. I have done it. And I have done it to myself. No one expects or demands it of me, it does not happen without my permission. It is all me and I just keep heaping commitment on top of commitment. All good, important, worthy things. But at the expense of what? Quiet, still time with my maker and savior and sustainer? Peace of mind and rest and perspective. Patience and focus and stillness. He has given me a servants heart and that is a good thing. But I have weak boundaries and that is a bad thing. And all of the “yeses” have left me undone or overdone – as in stick a fork in me ’cause I’m done. So what does all of this have to do with Easter? Well, pretty much everything. 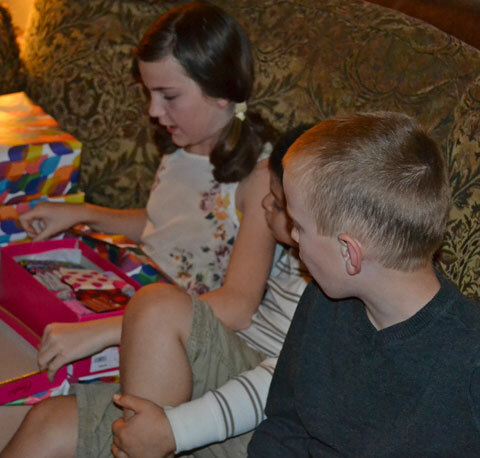 Normally at Easter we have a house full of loved ones; those born to us and those gifted and chosen. We prepare for weeks and then we gather together, serve a huge meal, hide dozens of eggs for a dozen (or so) kids and I truly love it. Every bit of it. But this year, I must be honest, this year I just wasn’t feelin’ it. And it kind of caught me off guard. All of the “yeses” finally caught up with me. I’m weary and spent. So this year, I said to my husband “do you think it’s okay if it is just us”. “Just us”, as if that were inconceivable, unthinkable, unimaginable. As if there were something wrong with “just us”. As if “just us” weren’t enough. He immediately said YES! But I had to give it some time to sink in. It is hard to let go of self-imposed expectations. Easter is a celebration that matters deeply to me and while I am not feeling the big production, I am feeling something that means more. I am feeling the need to renew, reflect and be still. And I’m feeling okay with that. So this year, it is going to be just us. Enjoying a very intentional, very quiet Easter. The house is decorated, but it is just for us. I have menus planned. But this year, they are just for us. Well, this afternoon, Nathan and I will head to the market to pick up our groceries. And there will be no rush or stress, we will enjoy our time together. This evening, we will sit down to a wonderful meal together and bow our heads to thank our savior for the blessing of His sacrifice. This morning I asked Nathan what “Good Friday” means and his sweet simple answer was “God wants us.” And so He does. He wants us so much that He bore all of our sin on that cross that we would be washed clean, forgiven and redeemed. And while Easter isn’t about baskets and bunnies and eggs, there is value in the joy of these family traditions. 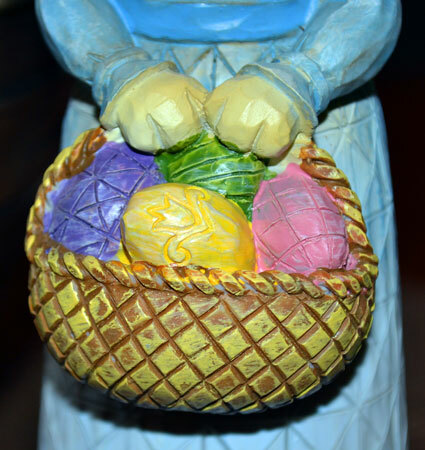 So, tomorrow, we will color eggs together and attend Easter Services (yes on Saturday – our church is big so we will save five seats Sunday for the many visitors we are sure to welcome). After the kids go to bed, Gary and I will sit together and stuff plastic eggs with scripture, hand written love notes, candy and coins for Sunday’s Easter Egg Hunt. And Sunday, we will hide those eggs and breathe easy, relaxed and happy as our kids hunt excitedly for their tiny treasures. The day will come all too soon when their enthusiasm for such things wanes. We must put the bustle aside once in a while and take the time to enjoy it now. And so we will. A bit later, we will sit down to brunch together at the picnic table under the Palo Verde tree. Just us. And we will linger, the rest of the day ahead to be still. Yes, this Easter, I hear him calling me to slow down and to proceed with intention. There will always be big gatherings at the Hacienda, big Easter. We are encouraged to gather and it is wonderful. But there must also be “just us”. And so it is of our relationship with the Savior who draws our hearts to seek Him. To find time with Him. To make time for Him. Just us. He and I. This entry was posted in Breakfast & Brunch, Easter, Faith and Following Jesus, Family, Holidays, Parties & Celebrations, Welcome Company, Welcome to My Kitchen and tagged Easter, Easter Brunch, family, Family Traditions, food, Good Friday, holidays on April 18, 2014 by Welcome Company with Danielle. Here it is, April 5th and I am writing my first blog post in forever. If that fact is not lost on you or you have noticed my absence, thank you friend for noticing. Truthfully, you probably weren’t surprised and just though I decided to leave the country, go into hiding or simply never show my face on cyberspace again after that … Super Bowl game. I can’t believe I just mentioned it. Out loud. Well, kind of. Really, I just whispered it in that sort of painful rasp that barely escapes clinched teeth. You know the one. That particular method of communication reserved especially for a disrespectful child who has inundated you with repeated arguments over why he should be allowed to take his skateboard down the slide and how you are so mean and just don’t understand his needs, conversation before coffee or the profession of great shame like … oh, I don’t know the acknowledgement of an epically disastrous, horribly embarrassing, absolutely unfathomable, Super Bowl. You’ve missed my crazy tangent laced run-on sentences, haven’t you? Yes, you might think after going on and on about the Broncos, declaring my allegiance, professing my love, turning my back on my Seahawk heritage, that it was all just too much. And yes, while that game was ugly and painful and seemed as if it would never end (kind of like the last few paragraphs I would imagine), thankfully, when all is said and done, it is after all – just a game. So, I am okay. My husband is getting there; I asked him this morning if he would like to say anything for the post – “no comment” was all I got in a clenched tooth rasp. Really, he’s getting there. We are still Broncos Fans. All is well. On the bright side, we got to have a party and spend the afternoon with friends and eat great food. 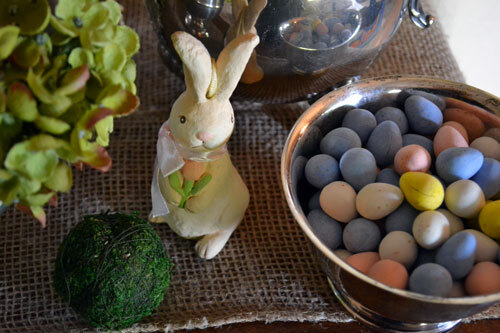 And regardless of the outcome, I would still like to share the party with you – even if it is April and I should really be talking about spring and gardening and Easter. I must finish what I started. So, a Super Bowl wrap up it is! The day started with a happy optimism and a lot of team spirit! And team effort, including some last minute sprucing up and decorating. This is how a 6 year old who is watching the outdoor patio TV helps wash peanut butter fingerprints and doggie nose smears off of the door. That would be by barely moving the cleaning rag while staring hunched over, mouth agape at said TV. Fitting really as we were getting ready to watch football. Ugg, caveman child clean window. I’m not really an artificial turf table cloth kind of gal so my Super Bowl decorating was more of a “nod” to team spirit. 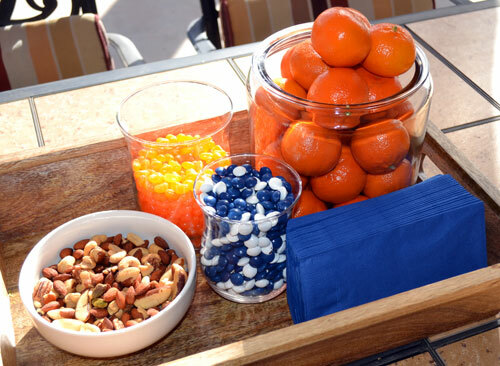 Okay, so the flag was a little “in your face” but the blue and orange edible foodie centerpiece was subtle. While peppermint patty candies and tangerine Jelly Bellies do not really taste great together, the colors were perfect so they were forced to get along. 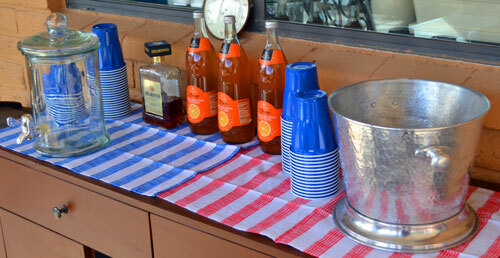 Orange sparkling soda and blue solo cups kept the team spirit going at the drink station. That was my plan and it did come together, mostly. The cupcakes didn’t happen but thankfully friends brought a huge tray of cookies and a cheesecake so all was not lost. The “Orange Crush” cocktail became beer in a cooler and a last minute add of Disaronno and diet coke – which tastes just like Dr. Pepper if you didn’t know. I guess you could just drink a Dr. Pepper, but what fun is that? 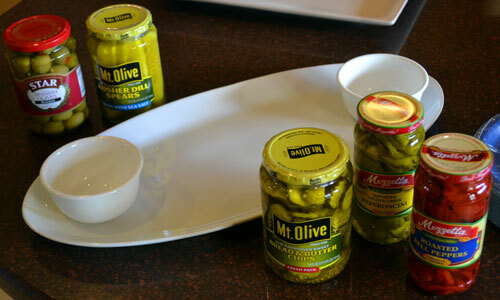 Relish trays are one of my favorite things to do for a party. 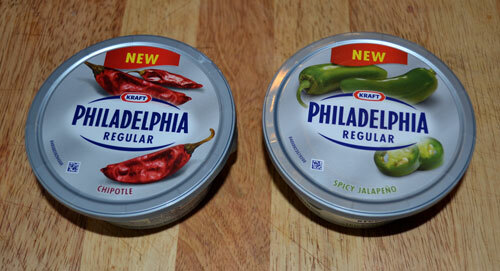 Yes, they are an old school appetizer but they don’t have to be. There are so many ways to jazz them up and limitless fun options. For this particular tray, I chose items that could pull double duty as toppings or were a good accompaniment for the pulled-pork sandwiches that were my main dish. I found this adorable tray at Tar-jey in the home decorating section. Not safe for food use. Whatever. That’s what parchment paper is for. 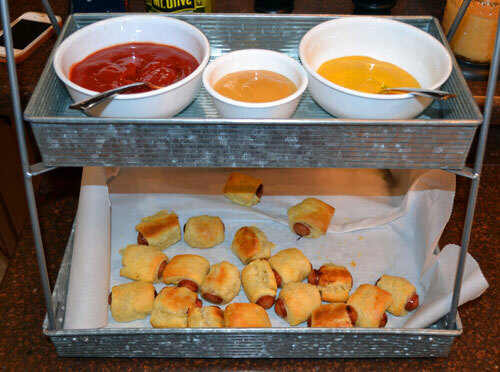 Sadly, a large portion of “pigs in a blanket” were wiped out by grabby little fingers before I could get a decent photo but this was a really fun way to serve them along with the accompanying condiments. Could I have just a moment please and ask you to take notice of my phone in the background. Top left corner. Yes, there it is. A. It is hard to stage good photos while feeding people at the same time. My friends already think I am a weirdo for always photographing food before they can eat it. Imagine if I fussed over stuff in the background too. B. Now, could we just observe a few seconds of silence as that phone has since taken a swim in the toilet and is no longer with us. When you pee and try to play Angry Birds at the same time, your mom’s phone can fall into the toilet. Let this be a lesson. I’ll bet this is the only blog you have read today that hopes to share appetizing food and party ideas and then talks about pee in he same post. Welcome new readers. Allow me to redeem myself. 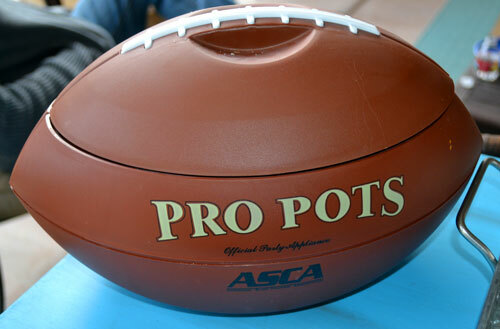 I could not let this post hit the internet without sharing my friend Lindsey’s awesome football crockpots with you. Yes, she filled them with a really yummy dips but the important thing for you to know that she is also a crafty, party planning, down to the last detail weirdo too. She is also our Kindergarten’s Classroom mom so she is actually even worse than I am. Ha! And that is why I love her. Well, one of the many reasons. I promise, I will tell you all about it sometime soon (remember, in my world “soon” is relative). Yes, those are all of “Tessa’s” cookbooks in the background. Every. Single. One. She’s my girl. So that was it, our Super Bowl Party. Great friends, great food, really bad game. The Jalapeno Poppers and Hot Wings (no picture – too busy with hot oil and everything) I told you all about, they were both a big hit. Thankfully, there were actually a few poppers left over so we were able console ourselves with a really amazing breakfast the next morning. Bacon always makes things better. As always, thank you so much for reading and for continuing to stop by – especially these days when even I don’t stop by as often as I should. Thankfully, I think that season is behind me and I’ll be back to regular posts! I’ll explain a bit more next time. For now, let’s just say my absence is due to the fact that I am “That Mom”, or so I’ve recently been told. Next week will be all about Easter so come back and visit. You are always Welcome Company! This entry was posted in Appetizers, Entertaining & Events, Entertaining Company, Holidays, Parties & Celebrations, Parties, Welcome Company, Welcome to My Kitchen and tagged Barefoot Contessa, Broncos Super Bowl Loss, Denver Broncos, Football Party, Ina Garten, Relish Tray, Super Bowl, Super Bowl Party Food on April 5, 2014 by Welcome Company with Danielle. Broncos vs. Seahawks; just a few days left now to kick-off! But don’t worry, there is still time to throw together a fun and delicious party. 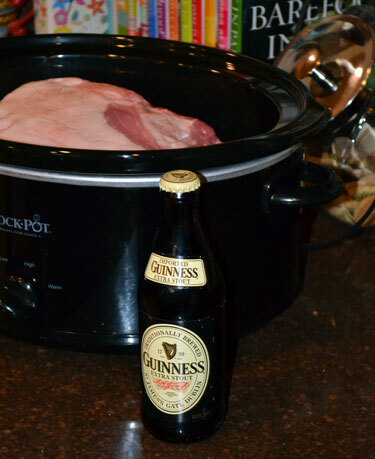 Today, I am going to share my own Superbowl Party Menu with you along with some tips for feeding a crowd with ease. But first things first; an easy, messy and oh so delicious twist (literally) on a classic. A few days ago, I shared with you my love for the Broncos and the Perfect Hot Wing. 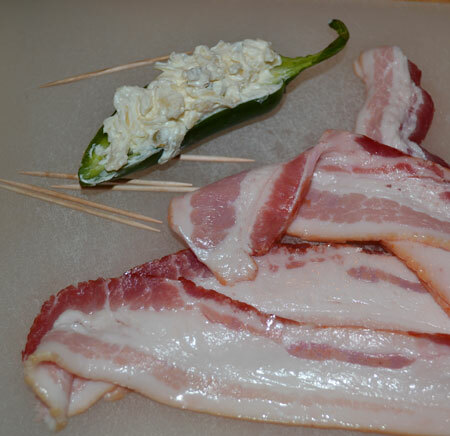 Today I am focusing on a game day appetizer that features something near and dear to my heart; bacon. While they aren’t the prettiest dish at the part, I’ll bet there won’t be a one left on the platter! How can you go wrong with a delicious pepper generously filled with a rich cheese mixture all lovingly swaddled in a piece of smoky bacon. Just give me a moment. Sorry, I thought I smelled bacon. The perfect bite. Well, two bites really. But hey, if you just need one, well that’s okay too. 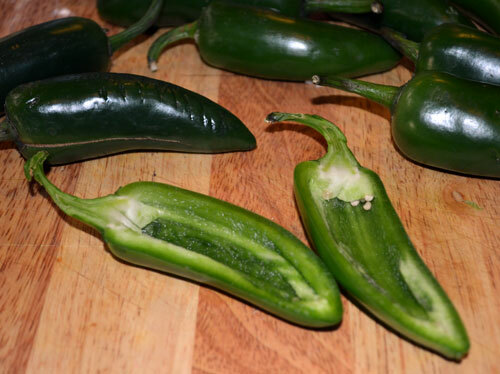 Using a sharp paring knife, halve the jalapenos lengthwise and remove the seeds and ribs, making a “boat” for your cheese filling. I do my best to keep the stem in tact because, well it looks pretty. Mix the cream cheese, grated cheese mayo and a pinch of salt and pepper to taste. 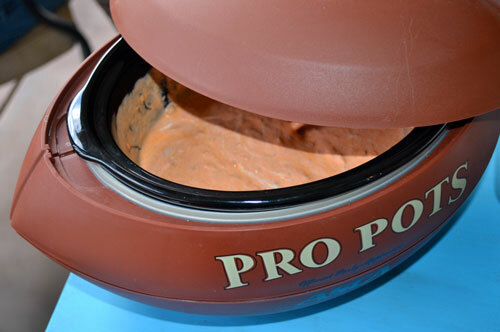 You have some fun options when it comes to the cheeses so don’t be afraid to experiment! Fill the peppers with the cheese mixture, evenly distributing it. 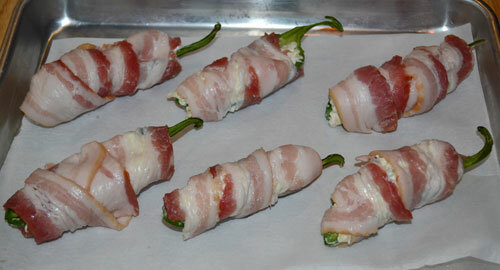 Wrap each pepper in a slice of bacon, being careful to overlap, leaving no seams if possible. The cheese is going to melt out a bit but we want to keep as much in as possible. Secure with a toothpick if necessary. 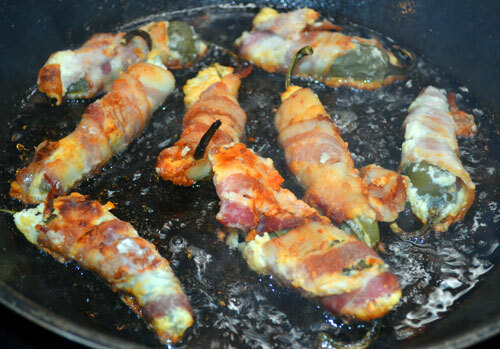 Bake at 400 degrees for 30 minutes and then crisp the bacon under the broiler for a few minutes if necessary. See, I told you. Messy. 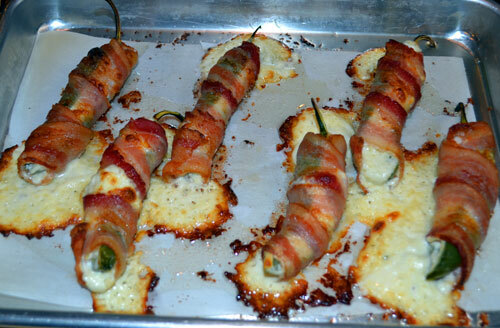 The good news is, they clean up nice and there is still plenty of ooey gooey goodness waiting under all that bacon! Besides, you have a baking sheet dotted with crispy melty cheese just waiting for you to grab a spoon! 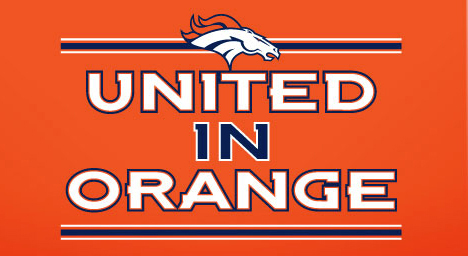 Game day, we will have a houseful of hungry football fans (hopefully all rooting for the Broncos). 1. Delegate, in other words let your guests help you. They will offer. Say yes. This is not easy for me. But over the years, I have learned my lesson. Plan your menu and then decide what you want to make and what you want to answer with when a friend asks “what can I bring?” Or if a friend says “can I bring __________________”, say yes and modify your menu a bit. 2. Decorate and have your house ready the day before. You think you will have time the day of. You won’t. Trust me. 3. On that note, set out and label all of your serving platters ahead of time so you know what you need and you have them ready. Arrange them on your “party table” so your layout is set. Frantically searching for a serving platter and a spot to squeeze it in on the table is not what you want to be doing game day. Right now, the friends and family who know me well are rolling their eyes and chuckling softly to themselves. Oh yes, they have seen me frantic. More than once. Don’t let it happen to you. A bit of early preparation will save you from the last minute crazies! Which brings me to number 4. When your guests ask if there is something they can do, say yes. Have some tasks already predetermined to delegate. They want to help. You need their help. Let them help. Yes, I am talking to myself. Hopefully you’re listening too. 5. Be flexible. Did you hear that collective gasp? That went with the eye roll and soft chuckle of those who know and yet still love me. If you run out of time or find you were a little overzealous with your plan … let stuff go. I know, I can hardly believe I just said it either. Focus on having fun and being with the people you love – or at least like to hang out with. I know I am certainly going to need a little help, it is also the Cub Scout Pinewood Derby this weekend. Heck, I may even have to let some stuff go. 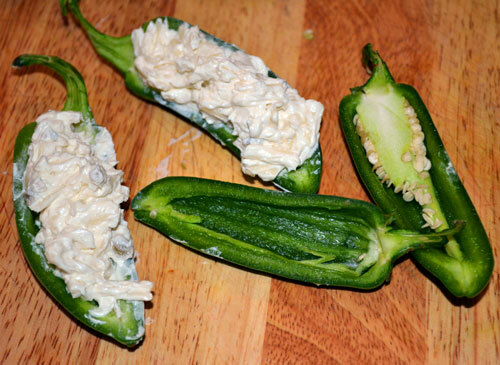 I promise you, it won’t be the Jalapeno Poppers. His car is almost finished. Are you sensing a theme here? 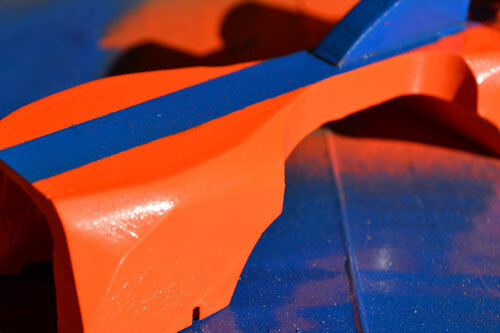 I’ll share the party and the Pinewood Derby with you in upcoming posts. This entry was posted in Appetizers, Entertaining & Events, Holidays, Parties & Celebrations, Parties, Welcome Company, Welcome to My Kitchen and tagged appetizers, Feeding a Crowd, food, Football Party, hot wings, Jalapeno Poppers, Party Tips, Superbowl Party, Superbowl Party Food, Superbowl Party Menu on January 31, 2014 by Welcome Company with Danielle. This coming Sunday is no ordinary Sunday. If you haven’t heard, there is a scheduled sporting event that consumes a large percentage of the American population. The championship of a sport that consumes a large percentage of the American population for roughly five months out of the year. In this house, we are among the football obsessed masses. Broncos Fans. We bleed orange. And this year, we are going to the Superbowl! 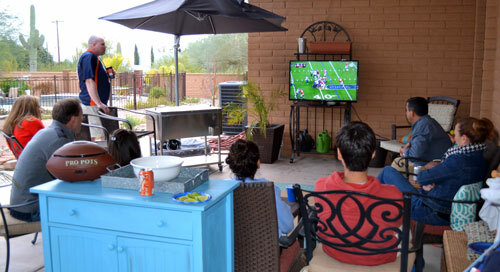 And of course, that means a Superbowl party. I am going to share with you a great Superbowl party menu and my thoughts on how to make the best hot wings, which are a must on game day, but first just a little background on how I came to be a Broncos fan. Oh come on, Indulge me. 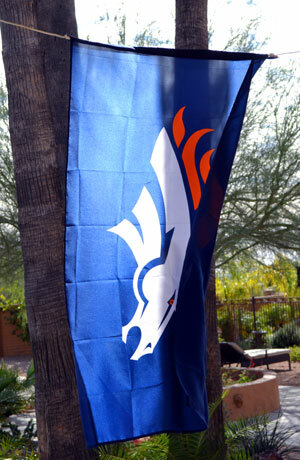 It is a bit Ironic that I am a Broncos fan as the Seahawks are also going to the Superbowl this year. I was born and raised in the Pacific Northwest by Seahawks fans, immersed in Seahawks culture. Some of my fondest memories of my dad center around the many Sundays we spent watching football together; the foam brick shaped “Hawk Block” being hurled at the TV over and over and over again – the Seahawks weren’t very good for a really, really long time. And then the day came when I sought my independence, my freedom and I boldly confronted my father and informed him that from that day forward, I was officially going to be a Broncos fan. I offered the small concession that I would still root for the Seahawks too, unless of course, they were playing the Broncos. And then I said this, “because they have a horse on their helmet and I like horses” and his face contorted into the strangest gaze as he slowly exhaled the breath from his body. And so it was. On that day, I broke away, turned my back on all I had know and became a Broncos fan. I’m sure my dad thought it was just one of about a million passing fancies but it was not. It stuck. To his credit, my dad made the most of it and a friendly rivalry developed, which, as it turned out, was even more fun than rooting for the same team. Especially since the Broncos were a whole lot better than the Seahawks. Yes, I chose my team because they had a horse on their helmet. For what other reason would a young girl choose a team of her very own? Still, there is a bit more to it than that. The Big Guy knew that someday, I would meet and fall in love with the most fanatical most devoted Broncos fan ever to walk the earth. It would not be my charm, quick wit or perfect apple pie that would win his heart; no, in the end it would be my Elway jersey. Just yesterday, we celebrated 18 years of marriage. Love, commitment, hard work and a united front on the field of play (well, at least on the couch watching the field of play). Friends, that is the secret to making a marriage work. 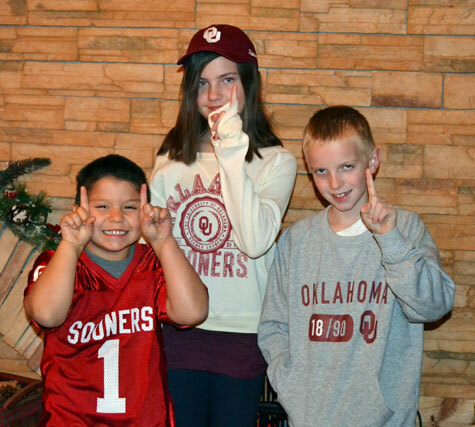 It is okay, even expected, to have a rivalry with your dad but with your husband it is best to root for the same team. And it is ALWAYS best to root for the Broncos. So there you have it. A Broncos fan not by birth but by choice. I am proud to say that we have been able to properly influence at least part of the next generation. Connor, my first born nephew, my first baby love. He’s had my heart from the moment I laid eyes on his pink wrinkly self and he just keeps charming his way into my heart. Like at the age of three when he told his mom he wanted to wear makeup so he could be “pretty like Aunt Dani”. Sweet, smart boy. I can share that story with you because I guarantee without doubt that not one of his friends reads my blog. And because his mom said I could so if it scars him, it’s her fault. And then, a few summers ago when he came down for a visit and asked me to teach him how to make a soufflé. We made two, blue cheese and chocolate. Come to think of it though, it was on that same visit the he ditched me at the mall, giving me the first indication that I was no longer completely “cool”. Apparently a 14 year old boy shopping with his aunt is style cramping and just not done. What is even more sad is that I actually did not expect it. I still thought I was cool. 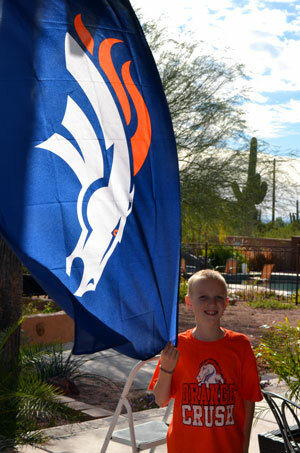 Not to worry though, all has been forgiven because with no undue influence, bribery or coercion, my sweet, smart, awesome nephew has chosen to be a Broncos fan. All on his own. All by himself. No undue influence. None. And low and behold, my niece Alex, Connor’s little sister (she’s on the right), has also chosen the to walk in the light. 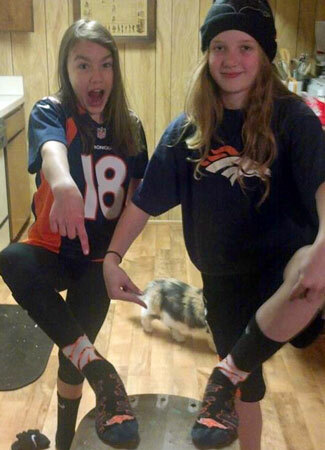 In fact, she and the friend pictured here with her wore their full Broncos gear to school on “Seahawk Day”. From what I hear, the school administration frowned on this anti-Seahawk treachery. Whatever. That’s my girl! I’m just so proud. Upon further examination of this photo, I believe that is actually just one pair of Broncos socks and they are sharing. Sharing socks. Still, I’m proud. She likes horses too. In fact, I chased her escapee pony through razor sharp wheat field stubble more than once. In shorts. But she’s cute and I love her and she’s a Broncos fan so I hardly notice the scars on my shins. [complete exaggeration] Or the sock sharing. Colin, Brenton and Grace I love you too and will mail Broncos jerseys to you when you come to your senses and realize you are really Broncos fans. So, readers, if you actually read all of that and didn’t skip ahead, bless you. I am pretty sure that you are ready for me to get to the food. I know Connor is, if for no other reason than to be certain I don’t pull out anymore embarrassing cute stories. Oh, I’ve got plenty but for now, we’ll just move on to talking wings. Hot wings are pretty much a game day must but not all wings are created equal. Personally, I am extremely picky about wings. Mostly because I don’t like to eat chicken off the bone. It truly gives me the heebies. In fact, the thought of eating a drumstick makes me break out into a cold sweat. Really, it does; you know I am not at all prone to exaggeration. Wings are smaller so I can eat them if they are crispy. And I mean CRISPY. C.R.I.S.P.Y. As in not one teeny tiny, itty bitty little bit of fatty smooshyness. Yes, I am using a made up word. It is the only way I can accurately depict the absolute grossness (that might be made up too) of biting into a soggy wing. Cold sweat shudder. So, now that you are hungry for wings, lets get to it. This isn’t really a recipe as much as it is a preference of technique. I hate to be the one to tell you this but the best way – by far – to make hot wings is to fry them. Deep fry them in HOT oil. Why do I hate to tell you this? Because it is messy. And a bit tedious. And somewhat perilous. But in the end, oh so worth it. While it is far easier to just throw a bag of pre-sauced, pre-cooked frozen wings into the oven and heat them up and it may seem healthier to bake homemade wings, there is NO WAY to ensure an acceptable level of crispiness in the oven. And I for one, just cannot risk the horror of biting into a mushy wing. Really, I’ve got to stop talking about it. Also, they just don’t taste as good. So, let the frying begin. 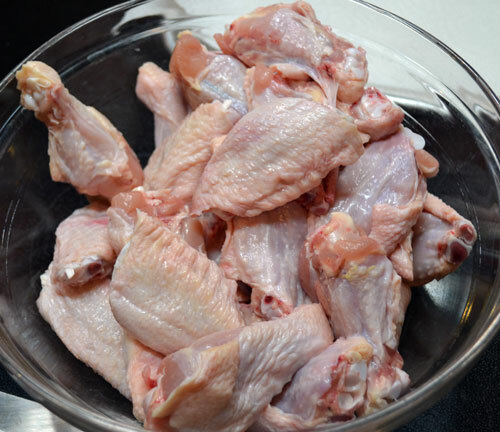 Start with fresh chicken wings from the meat counter. You can buy raw frozen wings that have already been prepped but I really prefer the fresh whole wings as they have less moisture and fry up better. Crazy enough, I can’t stomach the though of eating (let’s just call them gross as to avoid anymore unfortunate made up words) a gross wing but I have no problem dispatching a whole wing into “hot wing” parts. Not grossed out a bit. I like to use a very sharp, heavy chef’s knife. First, remove the tip of the wing. I put the tips in a baggie and then freeze them so I can add them to the pot the next time I make chicken stock. Next, pull the wing gently open and carefully run your knife between the two parts, cutting through the soft spot at the edge of the joint, separating the two pieces. Once they are all separated, pat the wings dry. 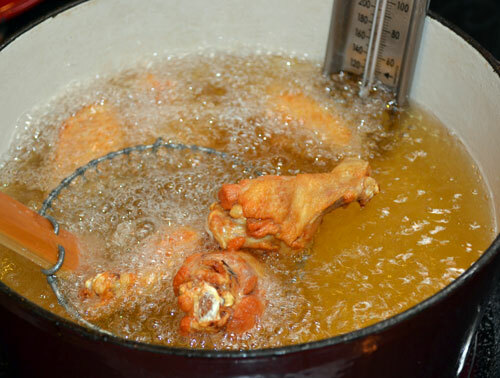 If you are using frozen wings, be sure they are completely thawed and all of the excess moisture is patted off. If they are too wet, you are going to have just a bit of excitement when you put them in the hot oil. Dangerous excitement. Speaking of oil, this is by far the number one tip I can offer. Do NOT fill your pot too full with oil. If you do, it will bubble over which is messy and dangerous. I fill a enameled cast iron pot about 2/3 full with canola or vegetable oil and then heat the oil on med-high heat to 380 degrees. 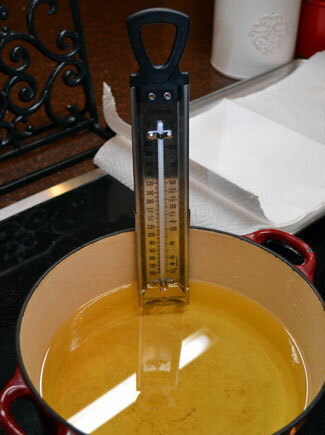 Use a candy thermometer for an accurate temperature and adjust your heat up or down as needed. 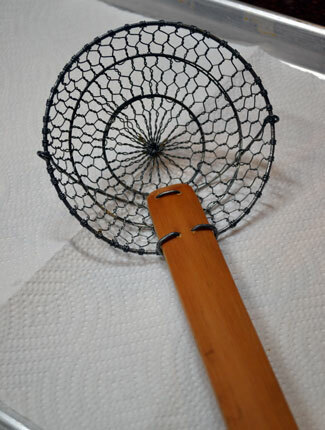 If you don’t have a kitchen spider, I highly recommend getting one as it is the perfect tool for removing the wings and draining the oil off of them quickly. I use mine for all sorts of things. I gently place the wings into the hot oil with a long pair of metal tongs that keep me a safe distance from the pot. DO NOT drop, plop or toss the wings in, think careful and gentle. On that note, it is also a good idea to use a back burner if possible and to keep the kids and pets out of the kitchen just to be extra safe. You can never be too safe or cautious with hot oil. 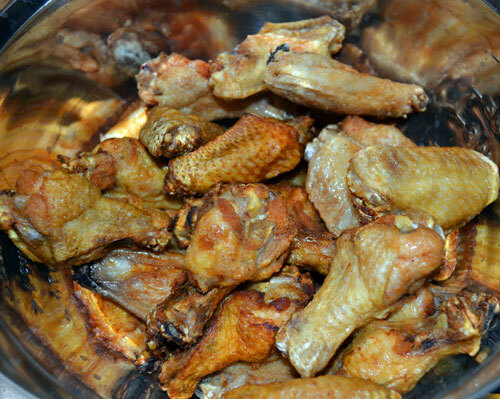 Fry the wings in small batches, about five at a time, for 6-7 minutes. I have seen recommended cooking times anywhere from 5 to 10 minutes but 6-7 seems to work best for crispy, juicy wings. Carefully remove the wings with your spider. Place the wings on paper towels to absorb any residual oil. If you are doing a lot of wings, you can keep the cooked ones warm on a sheet tray in a 250 degree oven while you finish up the remaining batches. 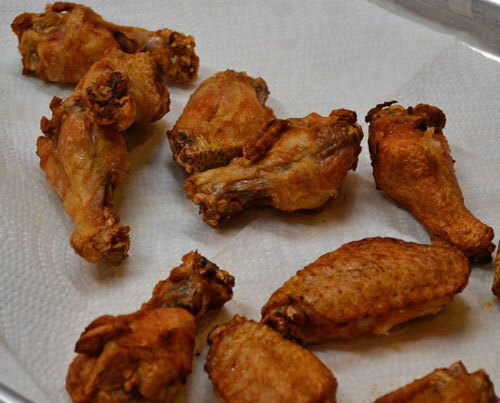 When you are done frying, it is time to get those wings dressed for the party. Traditional wing sauce is a cayenne pepper based sauce. We like Frank’s RedHot and follow the recipe right on the back of the bottle, with just a couple of tweaks. 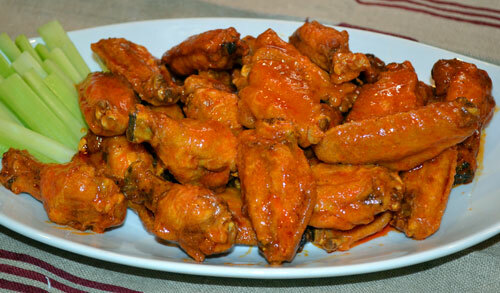 For 2 1/2 pounds of wing pieces you will want to mix 1/2 cup of hot sauce with 1/3 cup of melted butter. I just put both the butter and the sauce in a small saucepan and heat them up together on the stove over medium heat. Once the butter is melted I add a pinch of salt and several twists of the pepper grinder. I don’t know if it really matters that much but I add a pinch of salt and a grind of pepper to everything. Even my bath water. Not really but I’m thinking maybe I should try it. 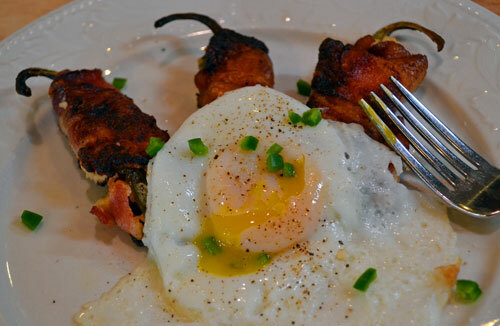 You can also add cayenne pepper or crushed red pepper flakes to taste for extra heat. Whisk everything together (except the bath water) and incorporate well. Pour the wing sauce over the wings and toss well to coat. 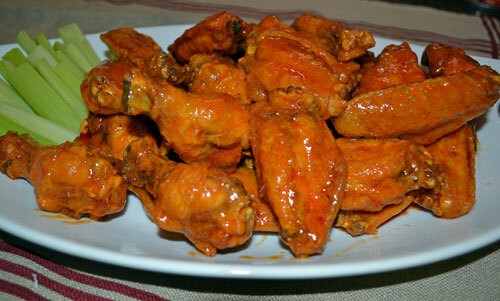 Serve them with celery and carrot sticks, any extra wing sauce and blue cheese or ranch dressing. After you’ve enjoyed the game and the most amazing wings, you’ll wander back into the kitchen happy (because the Broncos won) and full only to face the pot of used chicken oil mocking you from the stove. Not to worry, click here for tips on re-using or disposing of the oil. That’s it! I hope you will give these wings a try for your game day festivities and of course, I hope you’ll be rooting for the Broncos. 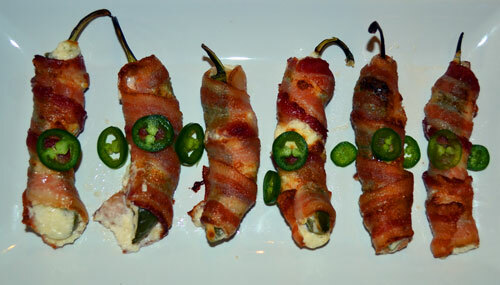 I will share another game day appetizer and the rest of my Superbowl Party Menu and plans with you in the next few days. Oh, and for all you 49ers fans out there, we welcome you brothers and sisters. Even if for only one game. This entry was posted in Appetizers, Entertaining & Events, Entertaining Company, Family, Holidays, Parties & Celebrations, Parties, Savory, Welcome Company, Welcome to My Kitchen and tagged appetizers, Broncos, Denver Broncos, Denver Broncos Fans, family, food, football fans, hot wings, Superbowl, Superbowl food, Superbowl Hot Wings, Superbowl Party, wings on January 28, 2014 by Welcome Company with Danielle. 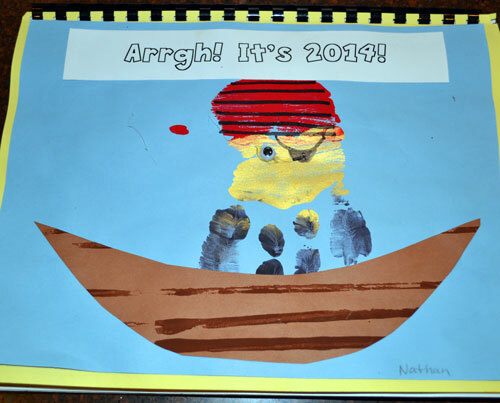 Nathan’s 2014 Calendar – I love these calendars the kids make at school and will be so sad when the year comes that they are all too big to make them anymore. I’d say it’s about time we do a little catching up. No, I have not given up blogging. No, I was not kidnapped by Aliens. No, I did not move to the south of France to hide away from the world. Although some days, that is still on the table. We have had a pretty challenging couple of months with some big losses in our family and my heart has been processing it all. Throw in a couple big holidays and a birthday and this unprepared lady just had no time to write or visit my favorite blogs. In early November, we received a call that my father-in-law, who had been battling cancer for last 10 years, was being moved to Hospice care with only a few days to a week before it would be his time. My husband immediately hopped on a plane to be by his dad’s side. Proving that he is absolutely the toughest guy I know, dad fought to live for another three weeks. I am so thankful my husband was able to spend most of that time by his dad’s side. After dad’s passing, our whole family flew out to say goodbye to grandpa. Well, goodbye for now anyway. We know he’s saving us a place at the best fishing hole around. We stayed with our family in Indiana for a bittersweet but very blessed Thanksgiving. 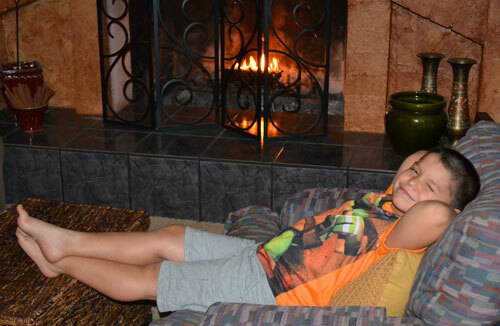 Sara was off with her cousins so I only have boy pictures and boy did they have a great time! True to their nature, David loved the history and “fact” finding opportunities and Nathan was all hands on energy. We only lost him once. He knew where we were and was evading. Nearly every gray hair I have is his doing. Nearly. They aren’t all his fault but I’m still sending him the cumulative salon bill someday anyway. It was hard to leave grandma Judy and the family, the big blue Victorian house, the crisp fall air, the falling leaves, the warm fire and the quiet time. We love you grandpa and we will miss you everyday. Until we meet again. After getting home from Indiana, there was not a moment to waste getting ready for Christmas. Christmas cards and letters, decorating, shopping, baking, teacher, neighbor and co-worker gifts, brunch, parties and even a Women’s Ministry event thrown in for good measure! Thankfully, my trusty staff was on hand to help – see picture below., way below. Oh, and a Birthday to celebrate too! Happy Birthday, Sara!! One year from now, we’ll have a teenager. Actually, less than a year from NOW. Gulp. 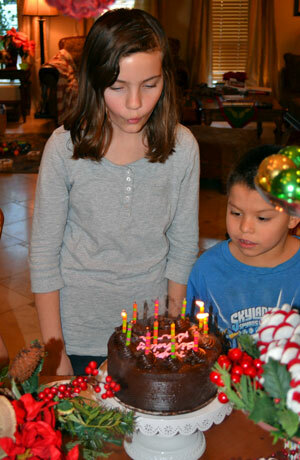 We try very hard to keep her birthday separate from Christmas and just celebrate her. With all that had gone on and all of the “Christmas catch-up” I had to do, Sara was very gracious about having a simple, low-key celebration this year. Low-key was officially supposed to come next year as the last of the “big” parties is sixth grade; says the parental management team. With the exception of Sweet 16 of course. Instead of a big party, we decided it would be just as much fun to take her and as many friends as I could safely fit in the van to Jump Street where they could trampoline themselves to their hearts content. Fun. Did I say fun? Oh my will I have to tell you all about it some time. For now, I will just let you imagine a half an hour in a car with six 11-12 year old girls, too many cell phones, too much perfume, lip-gloss and nail polish (all of which were opened, sprayed, dripped and gooped in my car at least once) and far too many pre-teen hormones. They are fun in groups of three or less. Anymore than that and a pack mentality seems to set in. A half an hour EACH WAY. Did I mention that. We do have a special birthday tradition just for her that we never miss. 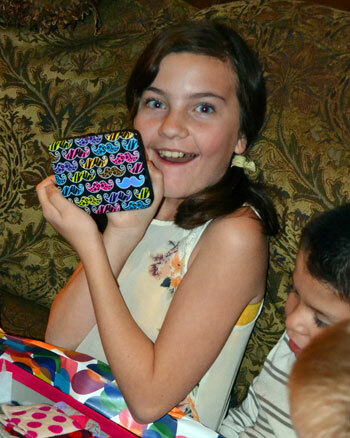 Every year, on her birthday, we take her out to dinner at the Cheesecake Factory and give her all of her gifts from the family. It is always a special evening and she loves it. This year’s coveted birthday items – crazy knee socks, floral combat boots and anything with a moustache print on it. Nope, I wasn’t kidding. Don’t ask me?? If it is safe, appropriate and makes her happy, I don’t question. One day soon, I will do a series of posts on some of the kids’ past parties. We’ve had some fun ones! For now you can check out the two I have posted; David’s Duck Dynasty Bash and Nathan’s Despicable Me Party. The Elf Management team wasn’t quite as creative as last year but we got the job done. Mostly. When you have a six year old who misses nothing and wakes up instantly hyper-focused on a mission to find the elf, it can be complicated if the elf has not in fact been moved because management was dragging into bed at 1am and … gasp … forgot. “Oh, no someone must have touched the elf” came in handy more than once. I love Christmas. Everything about it. Next year, my goal is to have posts ready ahead of time so I don’t miss sharing this wonderful season with my blogging friends. Unless you are prepared in advance, It is just too hard to write and keep up with all of the “busy” while desperately trying maintain focus on what truly matters. Lesson learned. Desperately busy. Which leads me to December 26th and hibernation. I am an extrovert who becomes an introvert for about two weeks a year; December 26th until the day the kids go back to school. I’m done. Finished. Spent. Turtle in her introverted shell. I may stay in my PJs all day. I may watch movies with the kids all day. In my PJs. ALL DAY. For many days. Needless to say, I am not a New Year’s party girl. Well, I’m not really a party girl at all (anymore – for any of my college friends who might be reading) unless it is a dinner party or a birthday party or there’s cake. You know what I mean. New Year’s Day consisted of bike riding and a picnic out back oh, and we did share the week with one very special and adorable house guest “Buster” or “Sassy McNoodle” as we like to call him. Well this is about as exciting as it gets around here folks! H.I.B.E.R.N.A.T.I.O.N. Only one kid made it to midnight. I’ll give you one guess. Yup. The youngest. Party animal – just look at that face. Indeed we are. And we are grateful to the God who loves and sustains us and we praise Him in all things. We trust in Him an look to Him for comfort even when we can’t find understanding. 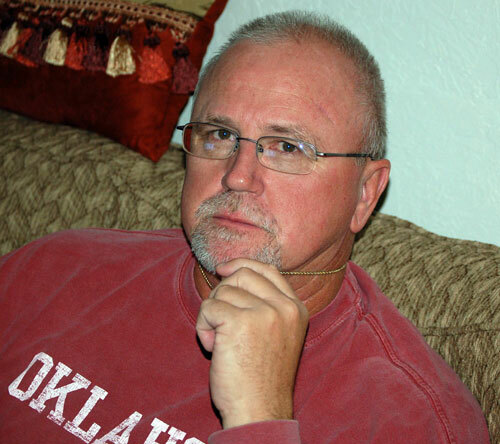 This one’s for you cousin Mike – Boomer Sooner! Yes, it has been a difficult and busy few months for our family but we are moving forward and I am so glad you and I are finally catching up. Thank you for hanging in there with me and for your readership and friendship. A special welcome to the new visitors who have stopped by and the readers who have so graciously followed Welcome Company. I have a long list of recipes, ideas, plans for the Hacienda, stories to share and adventures to come. I am looking forward to all that 2014 will bring. I hope each and everyone of you had a wonderful holiday and got some time of your own to “hibernate” with those you love most. 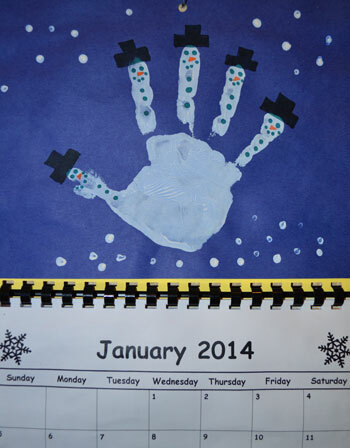 May 2014 be a year of blessing, adventure, friendship, family and fun. And may we be thankful to the God who loves us in all that may come. This entry was posted in Birthdays, Christmas, Faith and Following Jesus, Family, Holidays, Parties & Celebrations, Motherhood, New Year's Eve, Noodles the Elf on the Shelf, Thanksgiving, Welcome Company and tagged blogging, Christmas, faith, family, food, holidays, Kid's Birthdays, kids, Motherhood, New Years, Parenting, Thanksgiving on January 17, 2014 by Welcome Company with Danielle. 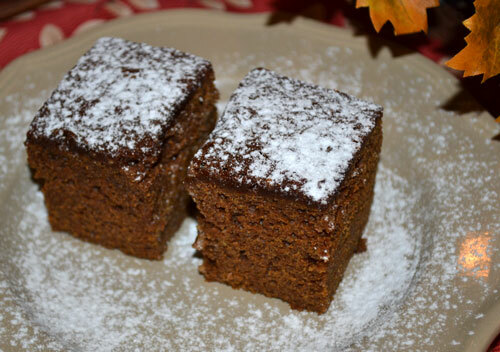 Today, I am excited to share something very special with you, just in time for Thanksgiving; Haddon Hall Gingerbread. Haddon Hall Gingerbread is a delightful, dark and distinctive cakelike gingerbread with deep notes of rich molasses and warm spices. It is another of the treasures from my Grandmother Ibby’s recipe box and is a favorite of my mom’s. 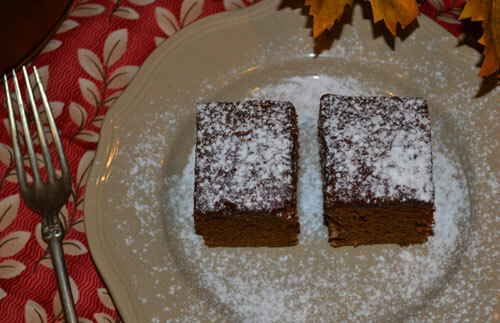 Not just a favorite fall treat but a favorite childhood memory. Crisp fall days spent playing outside or afternoons walking home from school, cold nose, tingling fingers. Opening the front door of the big old Victorian house, a deep breath and a spreading smile as she is greeted by the scent of her favorite gingerbread baking in the oven. I can just picture her standing there in her cotton dress, knit sweater, saddle shoes, dropping her books and inhaling deeply, happy to be home and anticipating that warm gingerbread dolloped with fresh whipped cream. What a picture of home and comfort. Perfect for this time of year when we nestle in and regain our focus on what is most important. Home. Family. Tradition. While in our family, this will always be my grandmother’s gingerbread, Haddon Hall Gingerbread does have some pretty interesting roots. And apparently a very interesting effect on men. Yes, this post started out as a simple and sweet remembrance from my mother’s childhood. 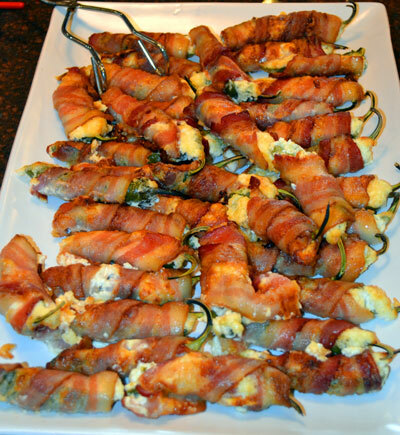 A favorite recipe to share for the upcoming holiday season. But as is so often the case, there is more to this story. The research I have done has yielded some intriguing and even amusing results and several different variations on the recipe; none quite the same as my grandmother’s. From what I’ve read, Haddon Hall Gingerbread originally gained the attention of American housewives in 1933 with a Gold Medal flour ad on the back cover of the November issue of Better Homes and Gardens magazine. And after reading this advertisement, I must say, how could it not? The ad encourages the lady of the house to buy Gold Medal flour for the “Kitchen Tested, simplest, surest, easiest way to baking success.” And if that wasn’t reason enough to purchase Gold Medal flour, the recipe set included in each bag was certainly an irresistible offer. Rosey blushing cheeks? A thrilling adventure without putting your shoes on and leaving the kitchen? What self respecting gal could resist that promise. Now, before you set aside 80 years of progress and attempt to manipulate the man in your life with baked goods, keep in mind the Gold Medal flour sacks no longer contain these bewitching recipes. Do not dismay! Fortunately for you, I have one of them right here. I’m not sure any of us could handle all 19 anyway but a little bit of a rosey cheeked thrill shouldn’t be too dangerous. Cream together the butter and sugar. Blend in the eggs and the molasses. Sift together the flour, baking soda, salt, ginger and cinnamon. 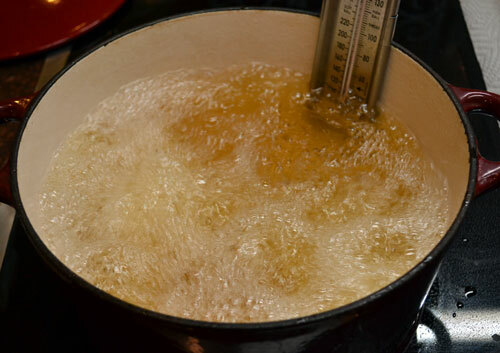 Add the dry ingredients to the wet ingredients alternately with the boiling water, beginning and ending with the dry. Pour into a greased and floured 8×8 pan and bake for 40 to 45 minutes. My mom remembers my grandmother always serving this with whipped cream but I think a sprinkling of powder sugar is pretty nice too. She also never served it with the cream cheese layer or the lemon sauce and frankly, I can’t imagine it needing either. 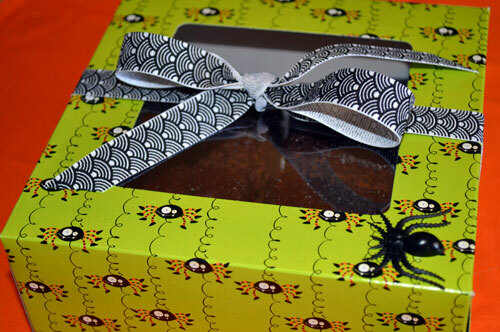 Just before Halloween, I made a batch and packaged some up for friends in a festive treat box. That was before I had done some research and discovered the true power of this recipe. I’m expecting a thank you note any day now. So, now we know that this is no ordinary gingerbread but where does the name “Haddon Hall” come from? It could be named for the Chalfonte-Haddon Hall Hotel in Atlantic City where Chef William J. Holmes worked but I imagine it goes back further than that. 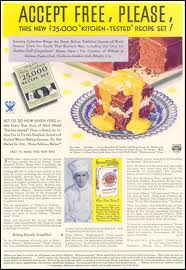 The Gold Medal flour ad says that with the addition of a cream cheese layer and lemon sauce, Chef Holmes’ creation was an updated version of an “old favorite”. According to Uncle Phaedrus, Finder of Lost Recipes, “Haddon Hall is a famous old medieval mansion in Derbyshire, England. It’s not too distant from a Derbyshire town named Ashbourne, which is famous for it’s gingerbread. 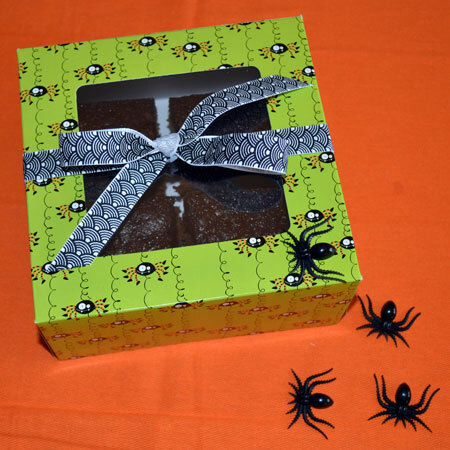 According to Derbyshire tradition, Ashbourne gingerbread was first created by a French prisoner of war, who decided to remain in the town after the Napoleonic wars. His special gingerbread recipe was then handed down through generations of his descendants. Gingerbread is a tradition in the area. Gingerbread men were made and sold in country towns at Easter Fairs and Autumn Wakes Weeks. 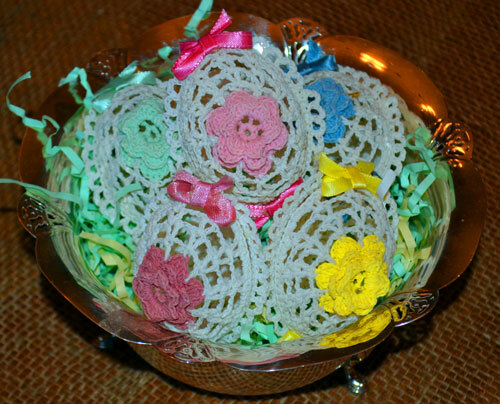 Fashioned in molds, they were decorated with colored hats and scarlet or white sugar buttons. They can still be found for sale today in Ashbourne and the surrounding area. Perhaps that “old favorite” does have its roots in the accounting above and in Ashbourne Gingerbread and the Haddon Hall of Derbyshire; I’d like to think so. But I could find nothing to confirm the origin with certainty so, it remains a food mystery. Which kind of makes this recipe all the more intriguing. Regardless of the origin and the mystery, the romantic Madison Avenue promises of 1933, or if this is an exact duplicate of the recipe from that magical little booklet in the flour sack or was again altered by my grandmother, this recipe is special. So break out the mixer, pans and measuring cups (if you dare) and be ready for your kitchen to be filled with the scent of fall and family and home. Anything else is your business. If you are looking for some great recipes for your Thanksgiving Dinner, here are a few of my favorite sides and Thanksgiving Traditions, originally posted last fall. This Thanksgiving, I hope you have a beautiful day filled with the people you love and a grateful heart brimming with joy for all that makes you thankful. As for me, I am so thankful for the incredible friends, readers and blogging community that stick with me and make writing Welcome Company such a joy! This entry was posted in Breakfast & Brunch, Cake, Christmas, Dessert, Family, Family Cookbook Project, Halloween, Sweet, Thanksgiving, Welcome Company, Welcome to My Kitchen and tagged baking, Cake, Christmas Recipes, cooking, food, Gingerbread, Haddon Hall Gingerbread, Holiday Baking, Holiday Recipes, Thanksgiving Recipes on November 25, 2013 by Welcome Company with Danielle. I think there are many reasons I love fall. The reprieve from the intense heat of summer. The colors. The hint of fun and joyful family time to come. Things seem to slow down or have the illusion of slowing down, anyway. So many things that make it a favorite time of year. 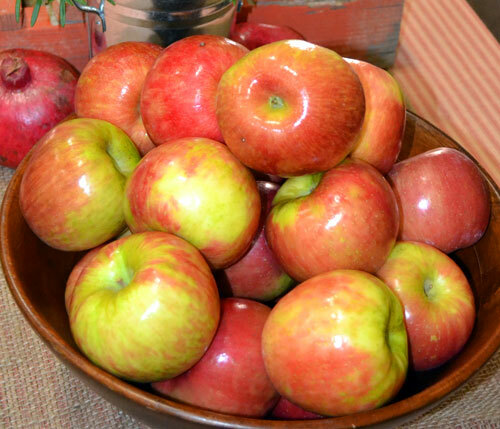 Crisp Apples. Apple Crisp. Apple Dumplings. Apple Pie. Homemade Applesauce. 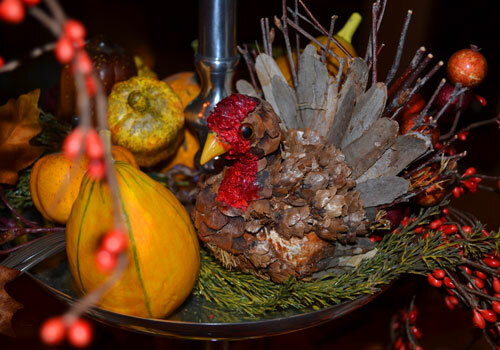 Our home, decorated in the rich and vibrant colors of the season. Warm and inviting. Gardening and potting flowers. I know, only in Arizona. Our reward for surviving the summer. Carving Pumpkins. Halloween Parties. Trick-or-Treating. Marshmallow Ghost Peeps. Ninja Turtles, Skeletons, Zom-Bees and Zombies. Thanksgiving right around the corner. And Pumpkin Bread. 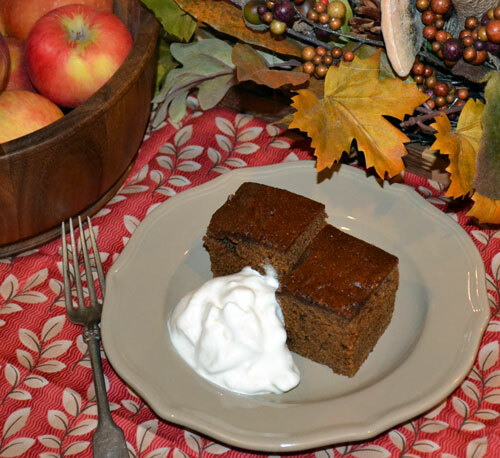 Not just any pumpkin bread, the best pumpkin bread ever. Well we think so anyway. One of my very first posts in fact. And while a few things have changed since then, like the fact that I don’t eat sugar or much wheat anymore, it is still one of my favorite things to make as a treat for the rest of my family or a gift for someone special. 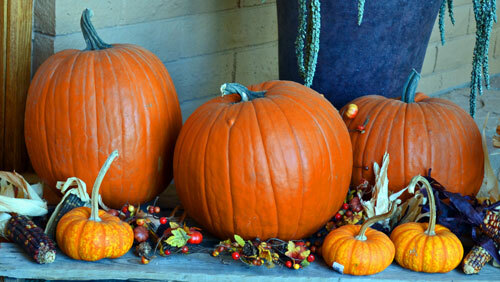 I have found some pretty tasty gluten and sugar free pumpkin recipes but there is really no substitute. Thankfully, I still enjoy the incredible aroma that fills the house with each loaf. Okay, and a little taste once in a while. Okay, and I ate a mini-Baby Ruth or two out of the kid’s Halloween Candy. Mostly sugar and gluten free. Mostly. Now go make some Pumpkin Bread! And watch out for Zom-Bees. They love Pumpkin Bread you know. This entry was posted in A Few of my Favorite Things, Breakfast & Brunch, Family, Halloween, Holidays, Parties & Celebrations, Motherhood, My Favorite Recipies, Parties, Sweet, Thanksgiving, Welcome to My Kitchen and tagged Apple Dumplings, baking, cooking, Fall, Fall Baking, Fall Decorating, food, Halloween, pumpkin bread, Thanksgiving Recipes, ZomBee Costume on November 13, 2013 by Welcome Company with Danielle.